WestJet is a low cost carrier headquartered in Calgary, Canada. It is the second largest airline in Canada behind Air Canada and has a fleet of 153 aircrafts (including the Encore sub-brand) serving 24.1 million passengers and earning CDN$284 million in 2017. An all Boeing fleet with variants of 737s and 767s (refer to table before for details) is used to transport customers to destinations within Canada and to the United States, Mexico, the Caribbean, Central America and Europe. Boeing 737 MAX 7 — 23 — 12 134 146 Deliveries begin in 2019. Some will be used to replace older 737-600s and 737-700s. Boeing 737 MAX 8 8 12 — 12 162 174 Deliveries began in 2018. Some will be used to replace older 737-600s and 737-700s. Boeing 737 MAX 10 — 12 TBA Deliveries begin in 2022. Some will be used to replace older 737-600s and 737-700s. Boeing 767-300ER 4 — — 24 238 262 Will be replaced by 787-9 in the future. Boeing 787-9 — 10 TBA Deliveries begin in 2019. Additional 10 options are available to be converted. Along with its subsidiaries WestJet Encore and Swoop, the WestJet Group focuses its operations at Toronto Pearson International Airport (YYZ), John C. Munro Hamilton International Airport (YHM), Calgary International Airport (YYC) and Vancouver International Airpot (YVR) and serve more than 100 destinations in 20 countries as at July 2018. The airline was recently named the Best Low Cost Carrier in North America, Fifth overall in North America and improved its ranking by 4 to 54th in the 2018 Top 100 Airlines list by Skytrax. 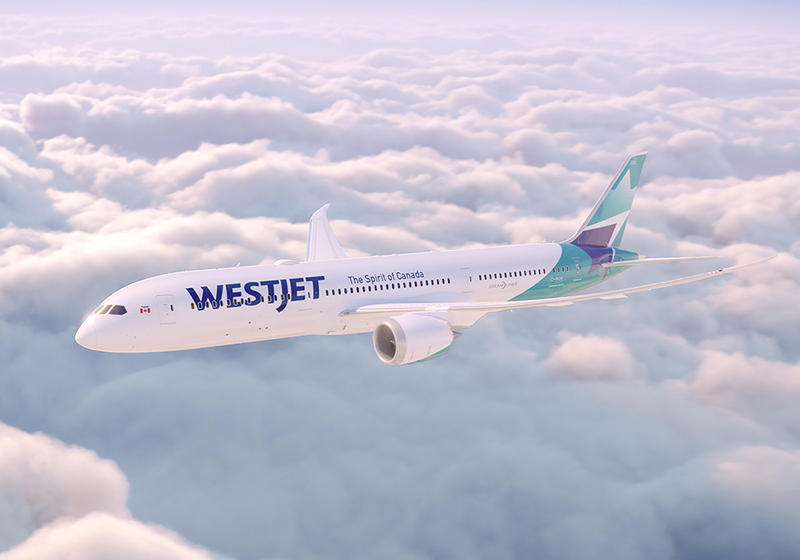 As part of its new international strategy and delivery of ten Boeing 787-9 aircrafts starting in 2019, WestJet decided to move upmarket with its existing domestic fleet. Part of this strategy is to replace the existing “Plus” product and create a new dedicated business class cabin named “Premium”. All existing 737s that are not being retired will be retrofitted with the new business product. It will also be standard in all new aircrafts being delivered in 2019. 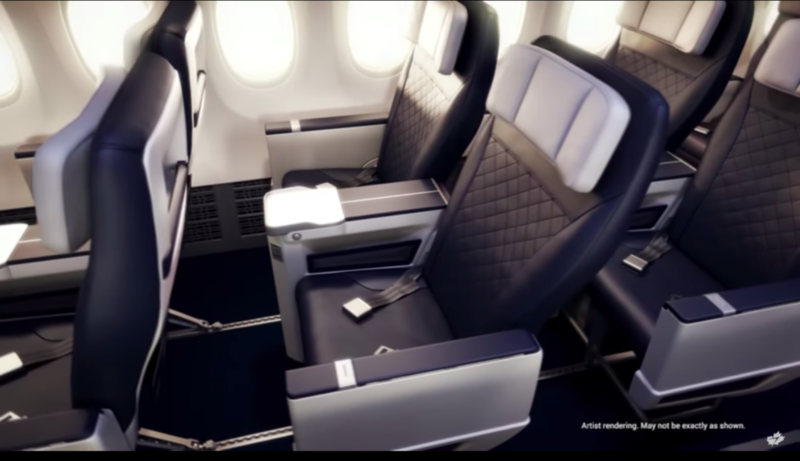 The key feature of the Premium cabin is the improved configuration from a 3×3 economy seating with the middle seat blocked to a 2×2 business recliner seating similarly used by other North American competitors. 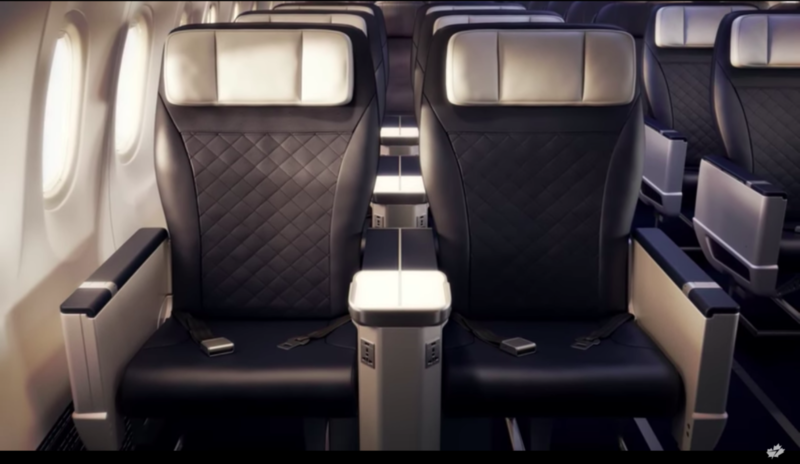 As with a true business class product, there will be a new curtain that will enclose the cabin space during flight. 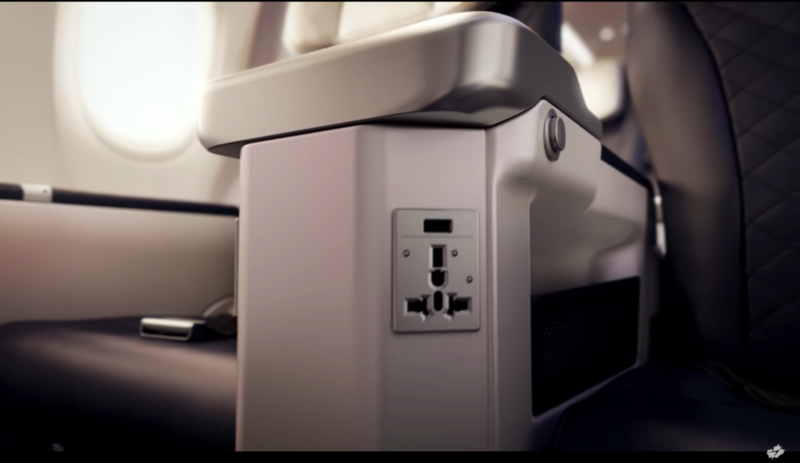 There will be 12 seats located in this new cabin each has its own AC power and USB ports. In flight entertainment will be streamed to the WestJet mobile application and WiFi is available for any connectivity needs. The airline noted that the new Premium seat will yield 20% more personal space for the passenger. Overall capacity will not be changed with the new configuration. In addition, all new 737 MAXs and older 737s will have ovens installed on board for the first time. This allows the airline to enhance the dining experience with hot entrees served on selected flights during meal times. The airline will also use the retrofitting time to paint the new livery introduced in Spring 2018 with the interior and exterior presentation of the 787-9.